Shop online at DronesEtc and enjoy up to 50% off a great selection of drones and drone accessories. Take advantage of the DronesEtc bundle offers today and save up to 30% off their already great prices. Act now and enjoy free shipping on all drones and drones bundles with this DronesEtc special offer. 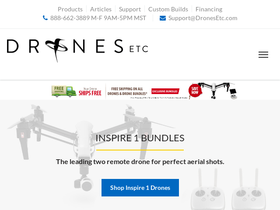 Shop today at DronesEtc and enjoy 50% off the Phantom 3 drone.